STUTTGART -- Porsche Automobil Holding said it expects first-half operating profit at its core sports car business to decline sharply, but positive effects from its Volkswagen stake will ensure group pretax earnings grow. 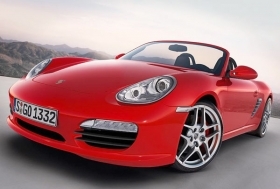 Porsche, which owns 50.8 percent of Volkswagen's voting stock, forecast sales of its 911, Boxster, Cayman and Cayenne models would sink 27.3 percent to about 34,000 vehicles in the six months through the end of January. "It is fair to say that operating earnings in the first half of the year were down by the same extent as the company's sales," CEO Wendelin Wiedeking told shareholders in remarks prepared for the annual general meeting on Friday. "On account of the special factors involved in our investment in Volkswagen, the overall earnings of Porsche Automobil Holding SE are higher," he added, referring to the year-earlier pretax profit of 1.66 billion euros ($2.17 billion). The Porsche CEO did not give any forecast for the full year to the end of July. To counteract a severe slump in demand on global car markets, the company will cut costs this year by far more than 100 million euros and will halt production in its main Zuffenhausen plant near Stuttgart by another 19 days before its summer break in addition to the 11 already taken since the start of December. Wiedeking said Porsche still plans to boost its stake in Volkswagen to 75 percent this year in order to eventually gain full control of VW's cash flows. The start of Porsche Automobil Holding's annual meeting was delayed Friday morning because of higher than expected investor interest. About 13,800 investors registered for the meeting. Last year 4,800 attended. Because of the huge interest, the meeting's start was delayed for 30 minutes because many visitors were unable to pass security checks in time.